The sympathetic nervous system, also called the orthosympathetic nervous system, belongs to the vegetative or autonomic nervous system, along with the parasympathetic nervous system. This system plays a role in visceral organ function (kidneys, digestive system, circulatory system) and regulates all automatic functions of the body, such as breathing, circulation, and digestion and excretion. 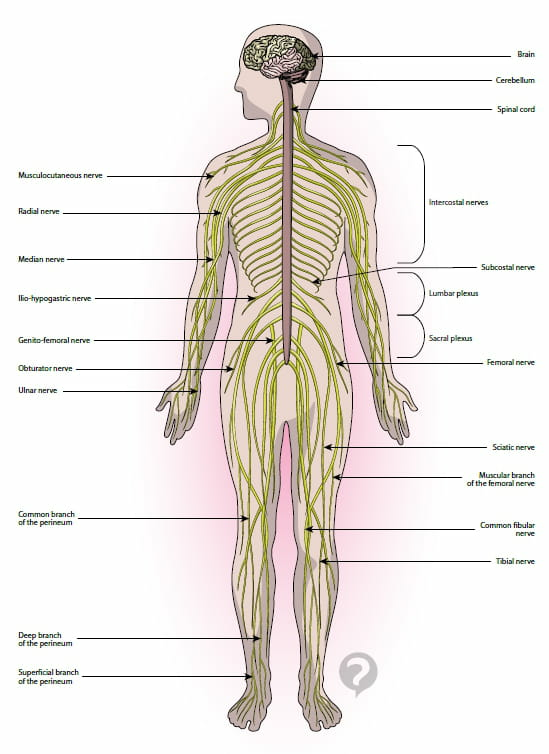 More specifically, the sympathetic nervous system acts with the help of two chemical mediators, adrenaline and noradrenaline, which, depending on the receptors they target, enable either an increase or decrease in activity of these controlled functions, notably blood vessel constriction and dilation, heart rate acceleration or slowing, and relaxing certain automatic muscles. Original article published by Jean-François Pillou. Translated by Jean-François Pillou. Latest update on August 19, 2014 at 12:21 PM by christelle.b. This document, titled "Sympathetic nervous system - Definition," is available under the Creative Commons license. Any copy, reuse, or modification of the content should be sufficiently credited to CCM Health (health.ccm.net).